SCSJ has been closely monitoring the issue of voter suppression among women due to newly implemented voting restrictions in North Carolina. The Washington Post recently published an article outlining the main reasons voter identification bills disproportionately impact women. The article concluded that the major factors driving disparate effects on women are poverty, senior status, marriage/divorce, student status, and voting history. Below are the national numbers presented by the Washington Post for these categories, compared to available data for North Carolina. Nationally: 1 million voters living below the poverty line also live more than 10 miles from their voting district. Poverty rate of women over the age of 18 was 14.6% in 2011 (compared to men at 10.9%) and the cost of identification is a burden in itself. North Carolina: Census Bureau statistics cited by the NC Women’s Center report 45.6% female-headed households with children live in poverty compared to 21.8% of all families with children. Overall, 19.5% of women, or 1 in 5, are living in poverty compared to 16.5% of men. Nationally: 1 in 5 seniors lack photo identification. The Census Bureau estimated that the 65 and over population of women is 24.3 million; for men, 18.8 million. North Carolina: According to the NC Department of Health and Human Services, in 2011, women represented 58% of individuals over 65 and 70% of individuals over 85 years. The poverty rate is skewed for women in this category and increases with age., further disenfranchising women. Women who are 75 years and older are three times more likely to be living below the poverty line than men. Nationally: 90% percent of women change their names when they get married. According to the Brennan Center, only 48% of voting age women have easy access to birth certificates. North Carolina: According to 2009 census data, there were 65,800 marriages and 36,700 divorces. 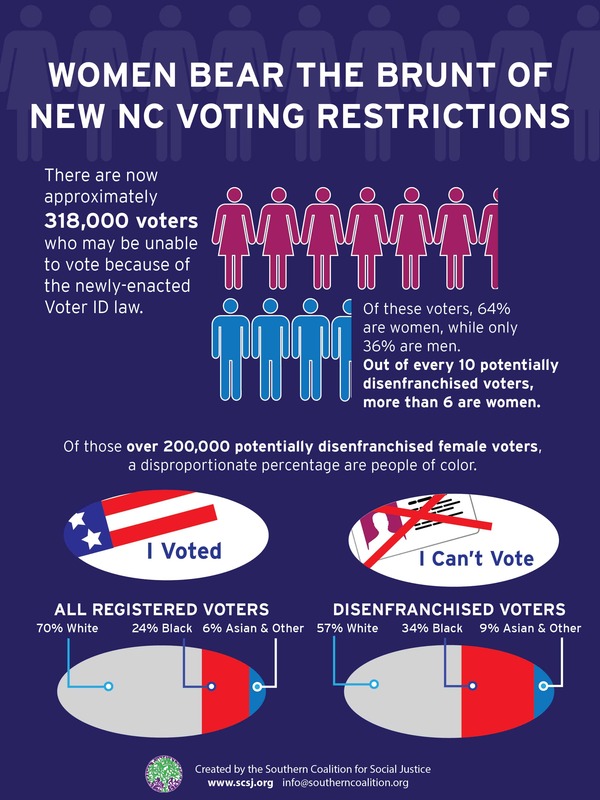 As with national numbers, it is expected that 90% of NC women changed their names due to marriage/divorce, and thus may not have photo ID that matched their name on a voter registration card. Nationally: There are 10.9 million female students enrolled in college compared to 8.8 million men. Students face problems of transportation, out-of-state identification, and problems with absentee voting. North Carolina: In the UNC system during Fall 2012, women account for 56% of the undergraduate students and 59.5% of the graduate students [56.7% across all degrees]. 63% of community college students are women. As in national-level data, the over-representation of women in North Carolina’s colleges makes them more prone to voting problems. Nationally: Comparatively, women voters make up 53% of the voting community. Hurdles enacted by Voter ID laws, by default, affected more women. North Carolina: Women make up 54.8% of the registered voting population in North Carolina [44.1% men, 1.1% unknown]. 62% of registered women voted in the NC 2012 election. Voter ID supporters claim that the law will prevent in-person voter fraud, though no such fraud has been documented. Statistics show that seniors, students, individuals with name changes, minority communities, and the poor are disproportionally affected by changes in the law. Given that women make up a large percentage of these affected communities, we can expect that women will have their votes suppressed at a significantly higher rate than their male voting counterparts. Previous Article: Was Election Day drug bust an attempt to intimidate NC black voters?